A fast-paced thriller involving the dirty politics and business behind the war in Iraq. Made for fans of political war thrillers containing some great intense action. Reuniting actor Matt Damon and director Paul Greengrass, the deceitful Green Zone trailers have made the film out to be the unofficial fourth installment to the Bourne franchise. The first thing you need to know is that Green Zone couldn’t be any farther from the Bourne saga. 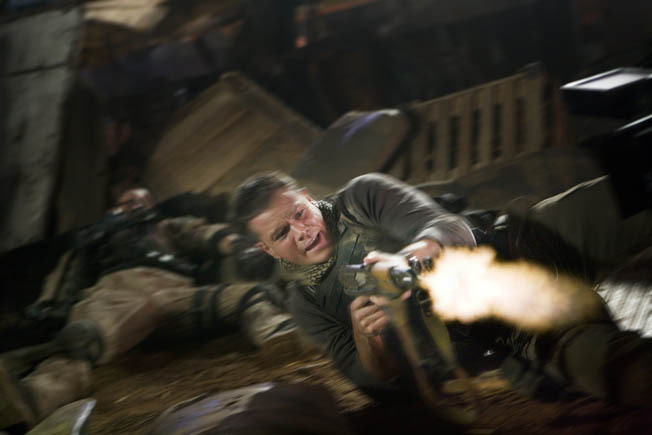 Set in Iraq in March 2003, Green Zone opens with an extremely intense scene showing the first bombing of Baghdad, capturing the “shock and awe,” the terror of what it must have been like to be on the ground when it all began. Shortly thereafter, we meet Captain Miller (Damon), a U.S. soldier leading an elite team sent to secure the supposed locations of WMD (Weapons of Mass Destruction). Because each location they secure shows absolutely no sign of WMD, Miller begins to question the integrity of the intel and its classified source. Because of his open inquiries and questioning the source of the intel, Miller catches the eyes of a high-ranking CIA operative (Brendan Gleeson, Harry Potter) who appoints him to a secret mission working against Washington’s highest power in the Middle East (Greg Kinnear, Little Miss Sunshine) and exposing the truth to the world. Those who get headaches from the shaky camera work styles Greengrass used in the last two Bourne movies may not want to consider seeing Green Zone. But that technique isn’t without reason; it allows the silver screen medium make you feel like you are in the action, like you are caught in the crossfire and there when the bombs fall. Some viewers will be upset with the overall message and moral of the film, calling it anti-American or unpatriotic. But it is just a movie, so take it as such. Green Zone falls into the same genre category as Body Of Lies, Patriot Games and Clear And Present Danger – just with a less complex story. It is a tense story-driven political thriller set in wartimes and featuring some of the most intense re-creations of war settings. The same way that The Hurt Locker captures bomb defusing, Green Zone captures ground combat. If it sounds like an interesting film, then you are sure to enjoy it.